Busy times: having ‘retired’ from my part-time job at the end of October, I launched my new business Extraordinary Writing on Small Business Saturday, 6 December. More on this below. More ‘spare time’ seems to mean that I’ve been roped in to more voluntary activities in my village, Menston in Wharfedale, Yorkshire. And, doing more of the everyday cooking, last night I made something worthy of mention I think – Tochitura Moldoveneasca – first time I’ve attempted it; again, more below. I was delighted to get a £500 grant from Lloyds Bank Community Fund to set up a project which has two principal aims: to help ameliorate the loneliness of many elderly people; to integrate more young people in our village with the wider community. The £500 will buy a couple of iPads and cover other small expenses for a year. I call the project ‘Teaching grandmother – from eggs to iPads‘. A small team of youngsters will teach elderly people first how to Skype on the iPad so they can talk to distant relatives and friends; second stage will be how to use search engines; third stage will be how to shop on line. At each session each youngster will have two elderly ‘pupils’ (I know of the advantages of learning in pairs from my English teaching days; also, my time installing ‘obsolete’ donated computers in Romania and teaching teachers and pupils how to use them gives me a good grounding even if the technology is, let’s say, a little more advanced! We didn’t even have Windows in the Romanian schools then, let alone an Apple OS). I did apply for enough to buy six iPads but the final stage was a public vote on the four projects short-listed. At the time I should have been campaigning for votes I was pretty seriously ill so couldn’t do it. We came fourth. However, we’ll set up as a ‘pilot’ project and if all goes well look for more funding to expand in the future. If you subscribe to the ‘healthy eating’ bibles look away now! 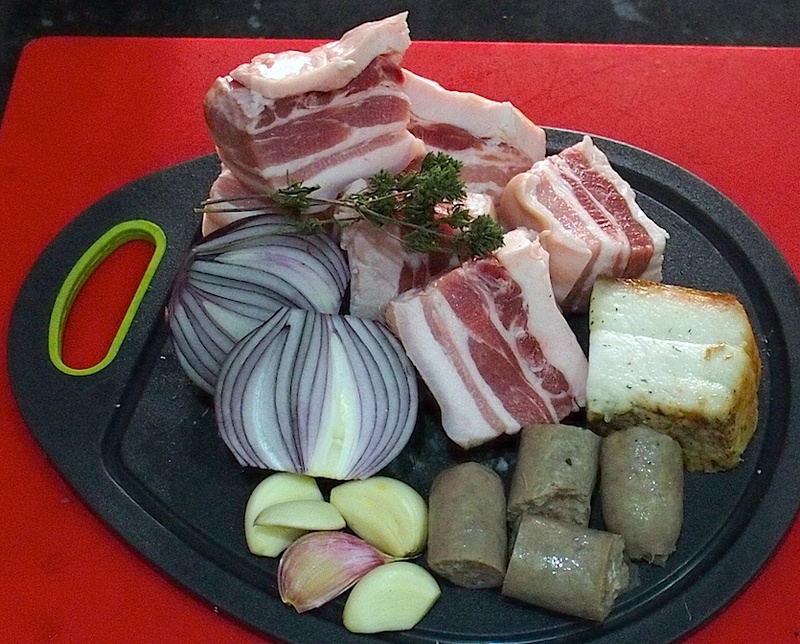 Principal ingredients for the tochitura: belly pork, smoked sausage, smoked back fat, onion and garlic. The sprigs of (Romanian) thyme are my own contribution to the recipe. One of the best meals I ever had in Romania, more than once, was in a school canteen – in a high school where I taught English and where I met my wife – Liceul Mihail Kogalniceanu in Miroslava village, Iasi ‘county’. I’ve eaten this dish many times elsewhere but it has never compared and that’s not surprising because if you look it up in a recipe book or on line there seems to be little agreement about the recipe. Many times it is made to end up as more like a kind of stew or casserole, but it should be (in my opinion) very nearly ‘dry’ – just a little zeama (juice). Because my Romanian in-laws brought two important ingredients when they visited, I decided to have a go based on how I thought the school cook might have done it. I was delighted that it turned out to be pretty good (though not quite up to the standard of the ‘school dinner’). An important feature is that there should be plenty of fat in the meat, either by using a ‘fatty’ cut (eg belly pork) or by mixing lean (eg shoulder) with fatty. Of course, the better tasting the pork the better tasting the tochitura; it took me months to find good tasty pork in the UK. Two other important ingredients are good smoked sausage and smoked ‘slanina’ (back fat). The latter two, home made and smoked, were brought by my mother-in-law. Other than that there are just onion and garlic, salt and pepper. It helps to have garlic from Botosani in the far north east of Romania – one clove will do the job of ten bought in the UK (and has an even better taste). The finished tochitura, for two, with mamaliga, fried eggs and cheese (Feta in the absence of Romanian fermented sheep’s cheese). So, the smoked back fat is sauteed a little, the chunks of meat added, browned then water added. Simmer until the meat is tender. Add the sliced onions and garlic, salt and pepper. Simmer for another ten minutes. Now I had to be inventive to get the almost dry, caramel covered meat I remember from Miroslava. So, I removed the meat, browned it again in a very hot pan with a bit of the fat. Skimmed the remaining liquid (a lot of fat now to be removed), reduced it to a thin layer in the pan then added back the re-browned meat. 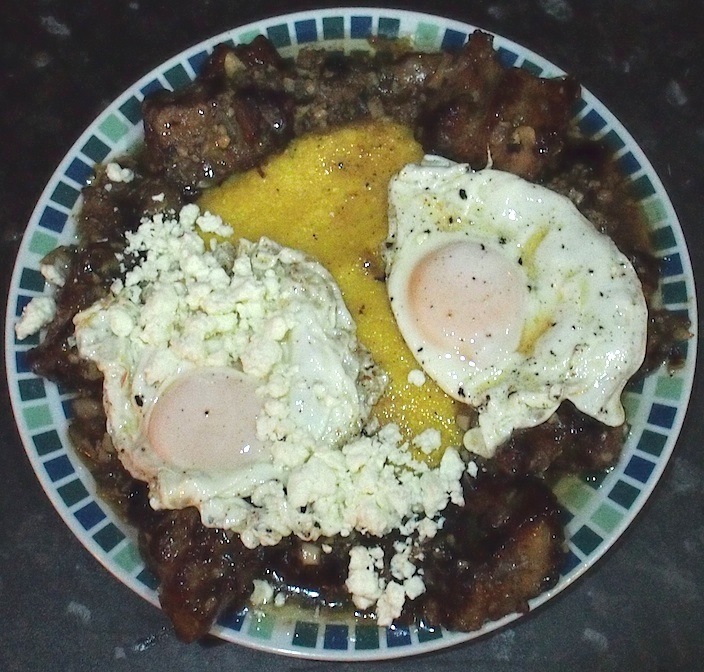 It should be served with mamaliga (firm cornmeal ‘porridge’), a fried egg and fermented sheep’s cheese (cas framantat). I didn’t have the latter but my wife doesn’t like it anyway so she had cottage cheese and I had crumbled Feta cheese (vaguely similar). Pickled peppers, cucumbers and green tomatoes (gogonele) are a perfect accompaniment. Having ‘retired’ from employment, and loving to write, I’ve decided to try to add to my meagre pension by writing, specialising in writing news pieces and features for companies or other organisations (for placement in the Press or house magazines) or writing, editing and producing newsletters and house magazines. I’m not sure how I had the audacity to choose the name I did, with so many ‘extraordinary writers’ among the bloggers I read regularly, but I did. I had landed my first job, to write, edit and produce a regular newsletter, by Monday 🙂 . I hope you are in top shape again and your illness has passed you by?